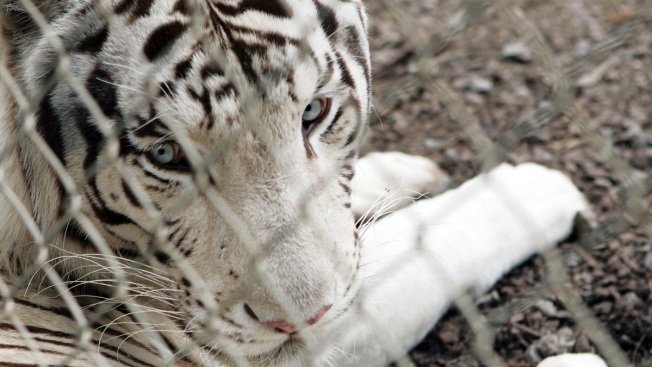 In this Feb. 7, 2006, file photo, a white tiger sits in its enclosure at the Zion Wildlife Park in Whangarei, New Zealand. A zookeeper was killed on Monday, Oct.8, 2018, by a white tiger at Hirakawa Zoological Park in Kagoshima, Japan. Police in southern Japan said Tuesday that they are investigating the death of a zookeeper in an apparent attack by a white tiger. Zoo officials said they believe Furusho was attacked while trying to move a male tiger from its exhibition cage to its night-time cage. The 170-kilogram (375-pound) animal is one of four rare white tigers at the city-operated zoo. Twelve giant pandas born this year at a panda research center in China were introduced to the public this week. Furusho was rushed to a hospital but was later pronounced dead. His autopsy results are pending. Police said they are investigating whether proper safety measures were in place at the zoo. No one saw the moment of the apparent attack. The tiger was sedated with a tranquilizer gun. Zoo director Akinori Ishido told a televised news conference that he was saddened by the loss of his staff. He said safety procedures at the zoo are designed in a way that keepers do not enter a cage for feeding or cleaning while animals are inside. The keeper somehow had entered the same space with the animal, Ishido said. Furusho's family has asked that the zoo keep the tiger alive, according to NHK public television. A rhino in a drive-thru safari park in Mexico was caught on camera chasing an SUV.